The Sentry Basic PDU products provide reliable power distribution for all the devices in the equipment cabinet, from 2kW-6kW per cabinet. Available in single-phase 110-120V or 208-240V power distribution with 20A or 30A options and 3-phase 208-240V power distribution with 20A, 30A, 50A, or 60A options. 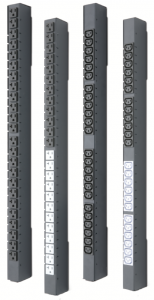 The Smart PDU products provide reliable power distribution coupled with remote power & environmental monitoring. Use the network interface to view power, temperature and humidity levels via Web browser, or SNMP-based and email alerts when conditions exceed defined thresholds. Server Technology -48VDC Power Distribution offers remote monitoring and power management for telecommunications networks. The Sentry -48VDC Switched products offer always-on technology and provide power distribution and remote power management in a compact 19" rack-mount enclosure. Sentry Power Manager is a powerful tool that allows monitoring, control capabilities, and management of multiple CDUs in single or multiple locations. Features include alarm management, reporting and trending of kW & kW-h information that can be used for energy efficiency calculations, device monitoring and billing.